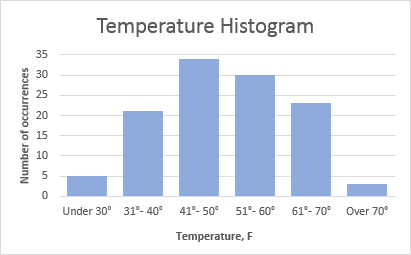 The tutorial shows 3 different techniques to plot a histogram in Excel - using the special Histogram tool of Analysis ToolPak, FREQUENCY or COUNTIFS function, and PivotChart. While everyone knows how easy it is to create a chart in Excel, making a histogram usually raises a bunch of questions. 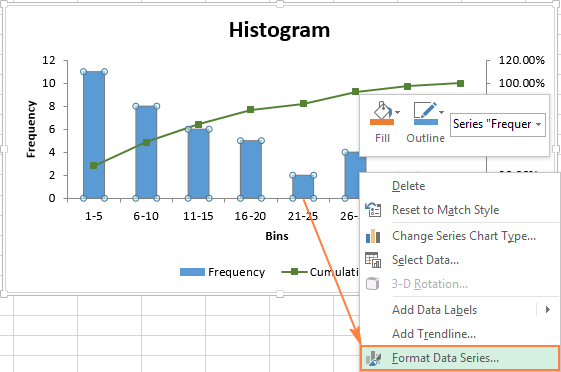 In fact, in the recent versions of Excel 2019, 2016, Excel 2013, and Excel 2010, creating a histogram is a matter of minutes and can be done in a variety of ways - by using the special Histogram tool of the Analysis ToolPak, formulas or the old good PivotTable. Further on in this tutorial, you will find the detailed explanation of each method. What is a histogram in Excel? Wikipedia defines a histogram in the following way: "Histogram is a graphical representation of the distribution of numerical data." Absolutely true, and… totally unclear :) Well, let's think about histograms in another way. Have you ever made a bar or column chart to represent some numerical data? I bet everyone has. A histogram is a specific use of a column chart where each column represents the frequency of elements in a certain range. In other words, a histogram graphically displays the number of elements within the consecutive non-overlapping intervals, or bins. 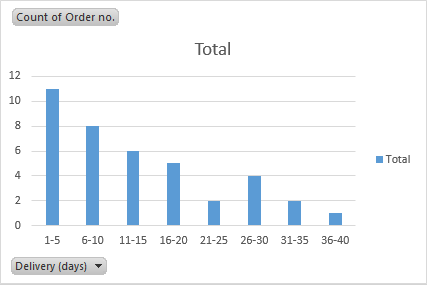 For example, you can make a histogram to display the number of days with a temperature between 61-65, 66-70, 71-75, etc. degrees, the number of sales with amounts between $100-$199, $200-$299, $300-$399, the number of students with test scores between 41-60, 61-80, 81-100, and so on. The Analysis ToolPak is a Microsoft Excel data analysis add-in, available in all modern versions of Excel beginning with Excel 2007. However, this add-in is not loaded automatically on Excel start, so you would need to load it first. In Excel 2010, Excel 2013, Excel 2016, and Excel 2019, click File > Options. In Excel 2007, click the Microsoft Office button, and then click Excel Options. In the Excel Options dialog, click Add-Ins on the left sidebar, select Excel Add-ins in the Manage box, and click the Go button. 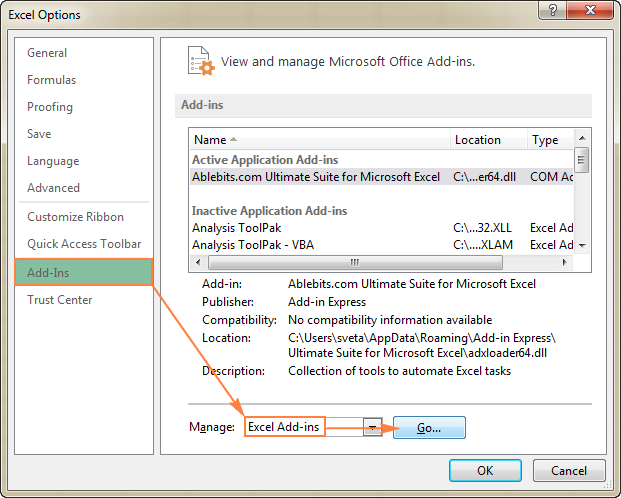 In the Add-Ins dialog box, check the Analysis ToolPak box, and click OK to close the dialog. If Excel shows a message that the Analysis ToolPak is not currently installed on your computer, click Yes to install it. 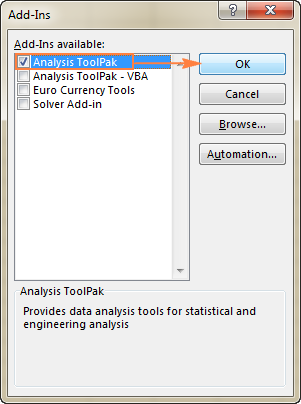 Now, the Analysis ToolPak is loaded in your Excel, and its command is available in the Analysis group on the Data tab. 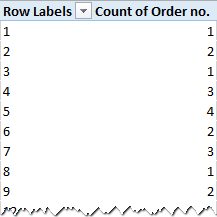 Before creating a histogram chart, there is one more preparation to make - add the bins in a separate column. Bins are numbers that represent the intervals into which you want to group the source data (input data). The intervals must be consecutive, non-overlapping and usually equal size. A value is included in a certain bin if it is greater than the lowest bound and equal to or less than the greatest bound for that bin. If your input data contain any values greater than the highest bin, all such numbers will be included in the More category. 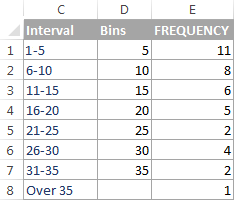 If you do not specify the bin range, Excel will create a set of evenly distributed bins between the minimum and maximum values of your input data range. Considering the above, type the bin numbers that you want to use in a separate column. 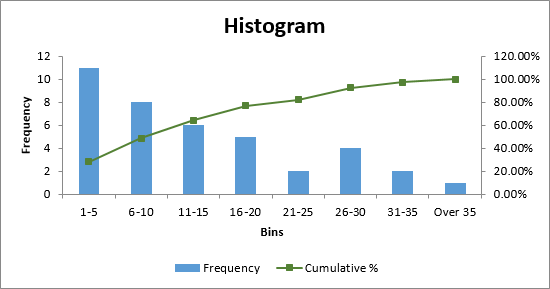 The bins must be entered in ascending order, and your Excel histogram bin range should be limited to the input data range. 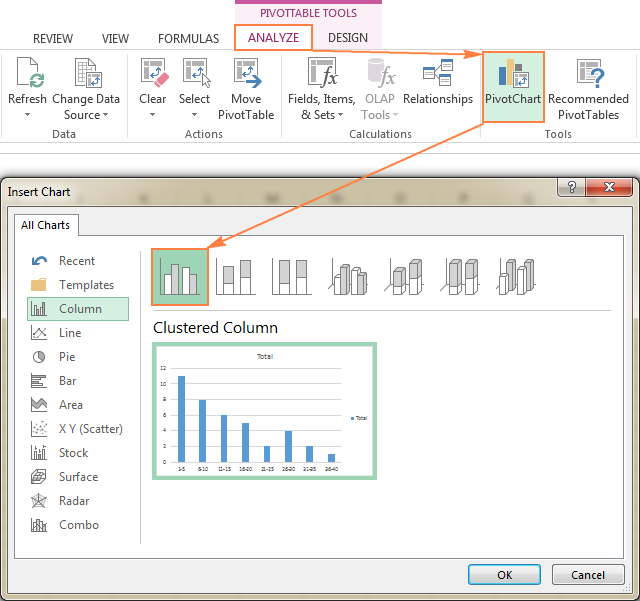 On the Data tab, in the Analysis group, click the Data Analysis button. 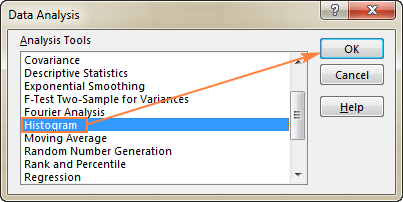 In the Data Analysis dialog, select Histogram and click OK. Specify the Input range and the Bin range. To do this, you can place the cursor in the box, and then simply select the corresponding range on your worksheet using the mouse. Alternatively, you can click the Collapse Dialog button , select the range on the sheet, and then click the Collapse Dialog button again to return to the Histogram dialog box. Tip. If you included column headers when selecting the input data and bin range, select the Labels check box. To place the histogram on the same sheet, click Output Range, and then enter the upper-left cell of the output table. To paste the output table and histogram in a new sheet or a new workbook, select New Worksheet Ply or New Workbook, respectively. 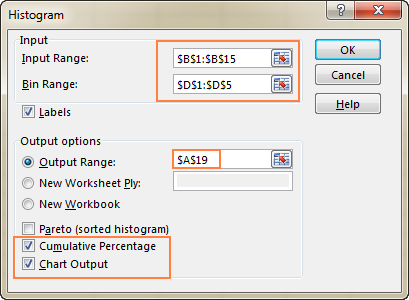 To present data in the output table in descending order of frequency, select the Pareto (sorted histogram) box. To include a cumulative percentage line in your Excel histogram chart, select the Cumulative Percentage box. To create an embedded histogram chart, select the Chart Output box. Tip. To improve the histogram, you can replace the default Bins and Frequency with more meaningful axis titles, customize the chart legend, etc. 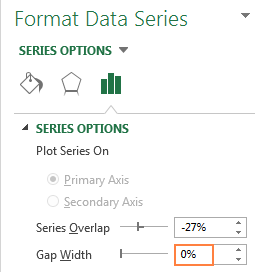 Also, you can use the design, layout, and format options of the Chart Tools to change the display of the histogram, for example remove gaps between columns. For more details, please see How to customize and improve Excel histogram. As you've just seen, it's very easy to make a histogram in Excel using the Analysis ToolPak. However, this method has a significant limitation - the embedded histogram chart is static, meaning that you will need to create a new histogram every time the input data is changed. To make an automatically updatable histogram, you can either use Excel functions or build a PivotTable as demonstrated below. 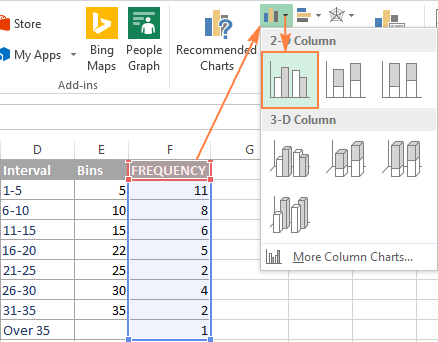 Another way to create a histogram in Excel is using the FREQUENCY or COUNTIFS function. The biggest advantage of this approach is that you won't have to re-do your histogram with each change in the input data. Like a normal Excel chart, your histogram will update automatically as soon as you edit, add new or delete existing input values. Now, we will use a Frequency or Countifs formula to calculate how many values fall into the specified ranges (bins), and then, we will draw a histogram based on that summary data. The most obvious function to create a histogram in Excel is the FREQUENCY function that returns the number of values that fall within specific ranges, ignoring text values and blank cells. Data_array - a set of values for which you want to count frequencies. Bins_array - an array of bins for grouping the values. 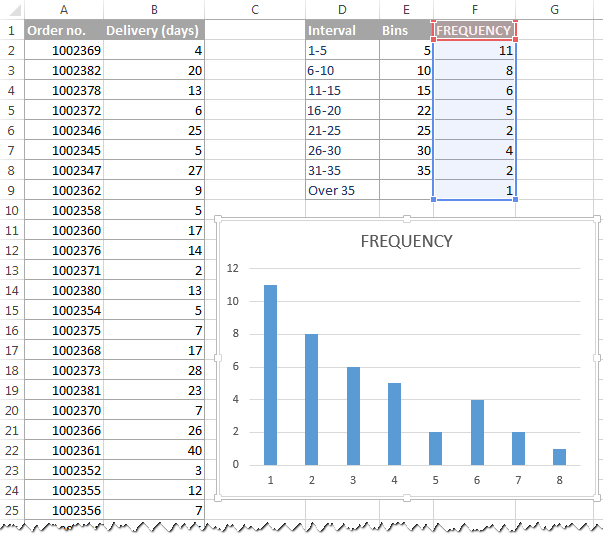 An Excel Frequency formula should be entered as a multi-cell array formula. First, select a range of adjacent cells where you want to output the frequencies, then type the formula in the formula bar, and press Ctrl + Shift + Enter to complete it. Like the Histogram option of the Analysis ToolPak, the Excel FREQUENCY function returns values that are greater than a previous bin and less than or equal to a given bin. The last Frequency formula (in cell E9) returns the number of values greater than the highest bin (i.e. 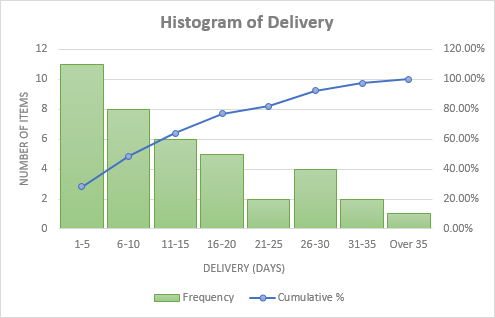 the number of delivery days over 35). Note. Because Excel FREQUENCY is an array function, you cannot edit, move, add or delete the individual cells containing the formula. 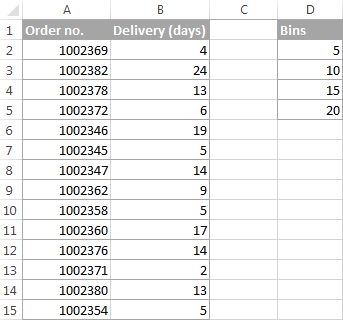 If you decide to change the number of bins, you will have to delete the existing formula first, then add or delete the bins, select a new range of cells, and re-enter the formula. 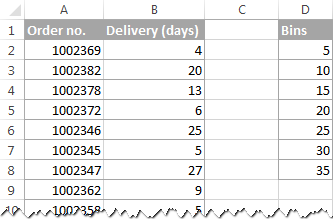 The formula counts how many values in column B are less than the smallest bin in cell D2, i.e. returns the number of items delivered within 1-5 days. 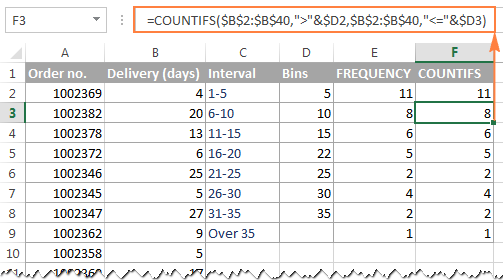 The formula counts how many values in column B are greater than the highest bin in D8. The formula counts the number of values in column B that are greater than the bin in the above row and less than or equal to the bin in the same row. "What is the reason of using three different formulas instead of one?" you may ask me. 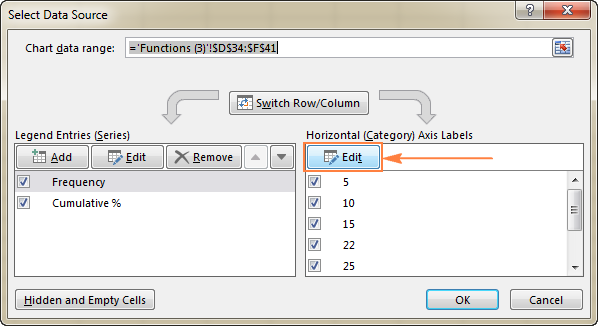 Basically, you get rid of the multi-cell array formula and can add and delete bins easily. Generally speaking, you already have a histogram for your input data, though it definitely requires a few improvements. 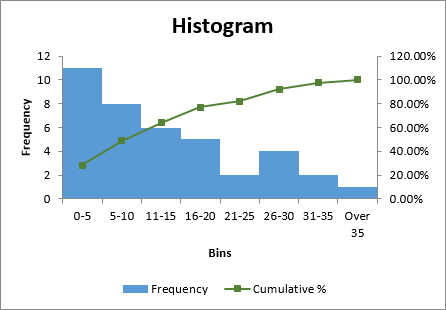 Most importantly, to make your Excel histogram easy to understand, you need to replace the default labels of the horizontal axis represented by serial numbers with your bin numbers or ranges. Tip. If Excel converts your intervals to dates (e.g. 1-5 can be automatically converted to 05-Jan), then type the intervals with a preceding apostrophe (') like '1-5. 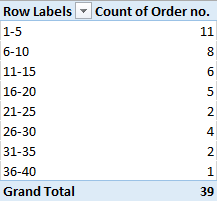 If you want the labels of your Excel histogram to display bin numbers, type them with preceding apostrophes too, e.g. '5, '10, etc. The apostrophe just converts numbers to text and is invisible in cells and on the histogram chart. If there is no way you can type the desired histogram labels on your sheet, then you can enter them directly on the chart, independently of the worksheet data. The final part of this tutorial explains how to do this, and shows a couple of other improvements that can be made to your Excel histogram. As you may have noticed in the two previous examples, the most time-consuming part of creating a histogram in Excel is calculating the number of items within each bin. Once the source data has been grouped, an Excel histogram chart is fairly easy to draw. To create a pivot table, go to the Insert tab > Tables group, and click PivotTable. 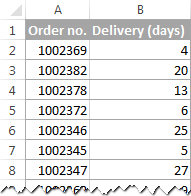 And then, move the Delivery field to the ROWS area, and the other field (Order no. in this example) to the VALUES area, as shown in the below screenshot. If you have not dealt with Excel pivot tables yet, you may find this tutorial helpful: Excel PivotTable tutorial for beginners. 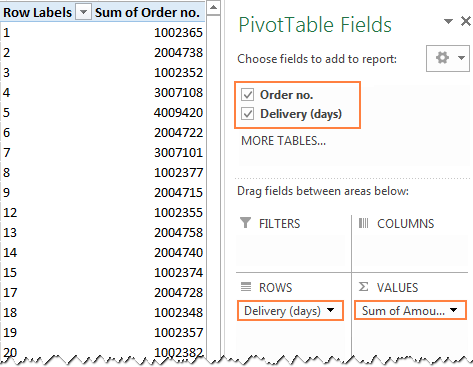 By default, numeric fields in a PivotTable are summed, and so is our Order numbers column, which makes absolutely no sense :) Anyway, because for a histogram we need a count rather than sum, right-click any order number cell, and select Summarize Values By > Count. 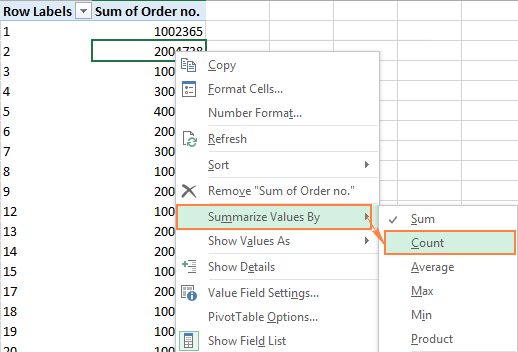 In the Grouping dialog box, specify the starting and ending values (usually Excel enters the minimum and maximum value automatically based on your data), and type the desired increment (interval length) in the By box. Delete the legend by clicking the Chart Elements button and removing the tick from the Legend Or, select the legend on the histogram and press the Delete key on your keyboard. Replace the default Total title with something more meaningful. Optionally, choose another chart style in the Chart Styles group on the PivotChart Tools > Design tab. Additionally, you may want to achieve a conventional histogram look where bars touch each other. And you will find the detailed guidance on how to do this in the next and final part of this tutorial. 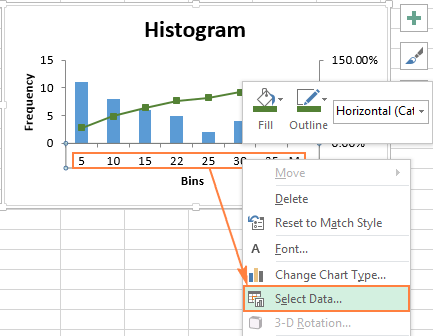 Whether you create a histogram using the Analysis ToolPak, Excel functions or a PivotChart, you might often want to customize the default chart to your liking. We have a special tutorial about Excel charts that explains how to modify the chart title, legend, axes titles, change the chart colors, layout and style. And here, we will discuss a couple of major customizations specific to an Excel histogram. On the right-hand side pane, under Horizontal (Category) Axis Labels, click the Edit button. This is how you draw a histogram in Excel. For better understanding of the examples discussed in this tutorial, you can download the sample Excel Histogram sheet with source data and histogram charts. I thank you for reading and hope to see you on our blog next week. 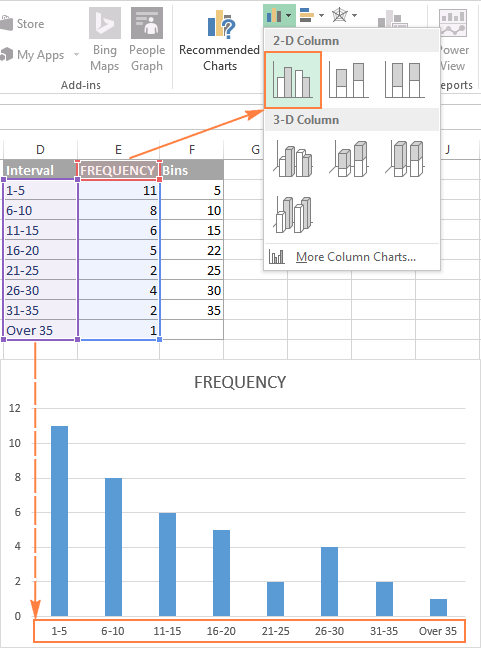 12 Responses to "How to create a histogram chart in Excel 2019, 2016, 2013 and 2010"
Thanks so much! Very helpful during a last minute attempt to draw histograms for a dataset on Excel. Thanks for giving such a good knowledge about 'Histogram' now i am looking for to present my work info. using Histogram.. Thanks so much for making this step by step chart. I was trying to use a histogram on my entire dataset but the bins were all over the place. Your help makes it produce the graph as exactly what was needed. Thanks much!! please how can someone plot a histogram chart of one column against another column. Perfect explanation of histograms created from a frequency table that already exists. The only problem is that I want to create a polygon at the same time without having to insert a duplicate column of the frequency. Trying to customize a statistical histogram chart on one column of data. I want to set the range of the histogram bins, have the ticks labeled instead of the bins and want to set the left of the axis to zero. How do I do this customization? This women is great, I have read many articles of her and all of them are easily explained and detailed. Thanks for sharing your knowledge !! Impressive detail. I learned a lot. Thanks for this post. I found it easier to do the COUNTIFS version by using just COUNTIFS($H$3:$H$26,"<="&$B3) for all rows (cumulative histogram), then making another column where I calculated the histogram values as C3-C2, C4-C3, etc.